Selecting the right UPS system does not complete your search for a total power backup solution. You need to choose the leading UPS batteries. 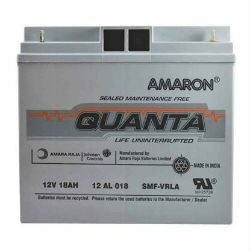 Our search for UPS batteries ends at Nantech, the authorized dealer for Amaron batteries. Tribal brings to you a wide range of Ultra zero-maintenance Tribal Hi-backup batteries. It incorporates a patented hybrid alloy system which minimises water loss and hence no frequent top ups. The unique paste formulation enables quick charging of the battery and also a higher backup. Tribal Hi-backup power batteries are manufactured in state of the art plant of Amara Raja Batteries which manufactures world renowned Amaron range of batteries. Amaron® Hi-Life Batteries come to you from Amara Raja Batteries Limited (ARBL), the largest manufacturers of Standby VRLA Industrial Batteries in the Indian Ocean Rim Region and Johnson Controls Inc., leading auto battery makers in the Americas and world leaders in Automotive Systems and Controls. Amaron® Hi-Life Batteries are made in an ISO 9001, QS 9000, ISO 14001 and TS16949 certified plant using world-class technology, making them long-lasting.